The app connects travelers directly to their elected representatives, urging policymakers to take immediate action to upgrade America’s aging transportation infrastructure and to replenish the Highway Trust Fund. "Our partnership couldn't come at a more critical time," said Ed Rendell, Former Governor of Pennsylvania and Co-Chair of Building America's Future (BAF). "The Highway Trust Fund is running on fumes and Congress is running out of time. Our app gives the American people the ability to send a clear message directly to their member of Congress: act now." The Highway Trust Fund, the nation's main source of funding for roads, bridges, and highways, is set to run out of money in late summer unless federal lawmakers agree on a funding solution to sustain it. "The American traveler's voice in Washington just got a lot louder," said U.S. Travel Association President and CEO Roger Dow. "Congress has known about our infrastructure needs for a long time — and yet has failed to act. Much like Foursquare invites you to 'check-in' when you've arrived at your destination, I'm Stuck will alert lawmakers to journeys that are too often plagued with delays that leave travelers sitting in travel purgatory. Now there's a simple way to urge Congress to find sensible solutions to these critical national priorities." 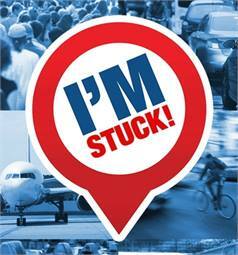 The mobile "I'm Stuck" app allows constituents to send a message directly to their U.S. representatives and their senators whenever they are stuck in traffic on the highway, delayed on a bus or train, or sitting on the tarmac. BAF originally released the app in 2013. The new partnership with U.S. Travel extends the app broadly to the travel industry and, through U.S. Travel's membership, to millions of additional American travelers. The app empowers Americans constantly suffering from prolonged commutes and travel delays by giving them a voice to advocate for increased investment in the future of America's infrastructure. Users can show elected officials why this is important by sending them a photo from wherever they are stuck. The new app also has specific messages for travelers stuck in highway traffic, urging Congress to act on the Highway Trust Fund. The app can be downloaded here and is available for both the iPhone and Android phone.